If the Auckland Art Gallery’s 2015 exhibition of young contemporary New Zealand painters, Necessary Distraction, was credible as a comprehensive survey , it was not in the artists selected, (so many anticipated names were missing), but in the longer term resonance of the participating artists’ subjects, materials, process and scale of their works. Okay, it is generalising to make the point, but it is still worth making; attention was accorded to small paintings and paint found itself as only one material among others. Subjects were poised precariously between figuration and abstraction, and paint was applied with a slacker attitude and confidence that often revealed evidence of good decision making by the artist. This summary inventory could also be a description of Gareth Brighton’s paintings in Until Your Room is Ready – these are works that could have easily found themselves accommodated alongside Necessary Distraction’s Julian Hooper, Nicola Farquhar and Stella Corkery. Brighton shares their faith in painting as a distinct means of expression, makes particularly good decisions about his choice of materials, and applies and moves paint around on the picture plane with attitude. There is a dropout and drop-dead assurance to his work in Until Your Room is Ready. Previously working with plywood as his base material to screen print on, Brighton’s attention has always, in part, been about directing attention to the patina of the surfaces he works with and it is fundamental to the experience and success of these painting. Now his plywood boards are covered in found commercial textiles and fabrics with patterns and design as the foundation for his decisions around applying paint or masking out, as he sees appropriate. 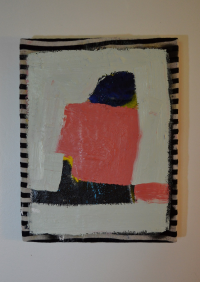 For works on such a modest scale (28 x 22cm) Brighton’s paintings possess a presence that controls the gallery’s spaces. Bed, a work in which paint is thickly laid over black and white striped fabric is superb. The fabric serving as an animated frame for a colour harmony of blue, pink and fragments of yellow that deliver the artist’s prime directive; ‘painted objects with the intention of making the viewer slow down and examine the materials and visual structure of pictorial communication.’ Until Your Room is Ready is, indeed, a necessary distraction, but also much more. Until Your Room is Ready 2018 – 2019 Mixed Media. Original generation time 0.2553 seconds. Original generation time 1.3730 seconds. Cache Loaded in: 0.0335 seconds.